A report from an innovative conference that aimed to create a new future — not just predict one. 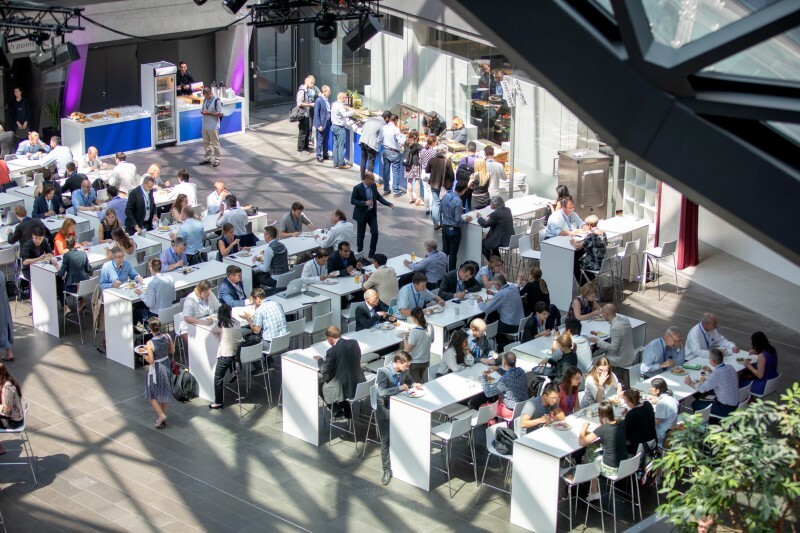 “This is the first meeting of its kind,” said Ulrich Betz, vice president of innovation at Merck Biopharma in Darmstadt, Germany, as he opened Curious2018 in July. The conference is one of a number of celebrations of Merck’s 350th birthday, all with the theme “Always curious — imagine the next 350 years” (see ‘350 years young’). 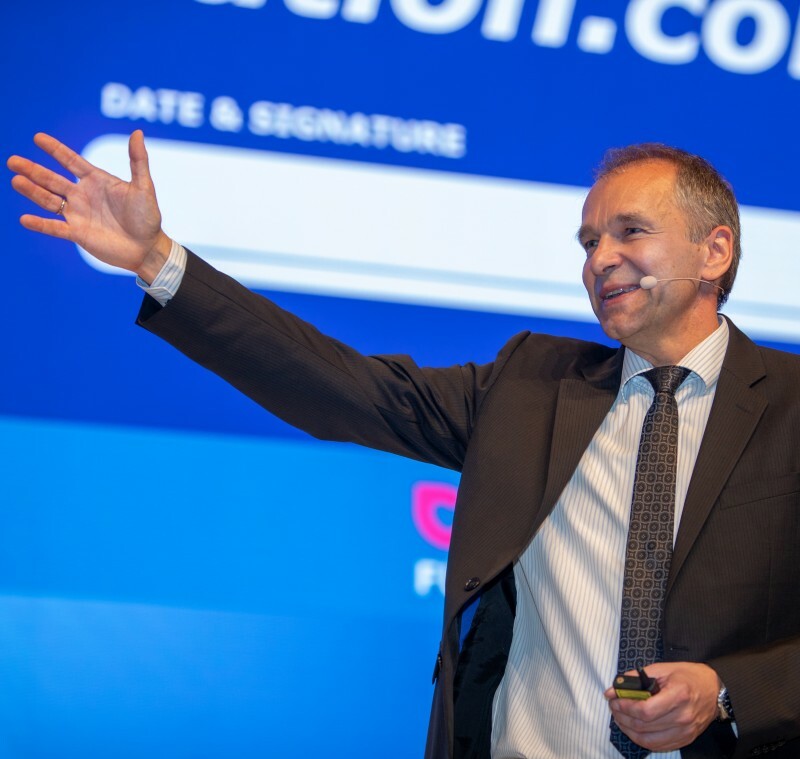 Betz was the driving force behind the conference, which welcomed delegates and speakers from around the world and across the scientific disciplines, and was attended by around 1,300 participants. Among the speakers were five Nobel prize-winners, several world renowned scientists including Craig Venter, and representatives of the European Space Agency (ESA) and the US Defense Advanced Research Projects Agency (DARPA) among others. 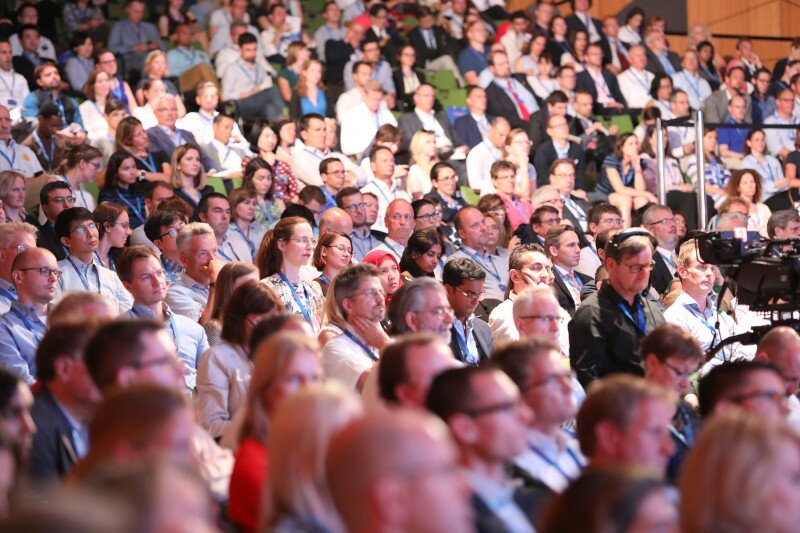 The conference covered topics including Healthy Lives — new breakthrough therapies and diagnostics; Life Reimagined — synthetic biology and beyond; Materials and Solutions — chemistry and more; Vibrant Digital — the power of in silico; and Bright Future — new ways of working and collaborating. Sessions dealt with humanity’s move from the Stone Age (Society 1.0) to today’s Information Age (Society 4.0), and looked forward to Society 5.0 — a human-centred technological age. And visitors pondered not just how the future might look, but also on the best way to get there. Scientific research, particularly within companies, is often strategy focused; that means researchers tend to find only the ‘known unknowns’. In contrast, many major discoveries have been ‘unknown unknowns’, found through fundamental research, an open mind and an ability to recognize opportunities, said physicist Daniel Zajfman of the Weizmann Institute of Science in Rehovot, Israel. Examples include liquid crystals that today power smartphone displays, X-rays now routinely used in imaging, and the physics that led to the global positioning system (GPS). “Strategy should provide direction, not control the process,” said Zajfman. “Beyond strategy, we need knowledgeable, curious, passionate scientists — and we need to give them freedom to think and the ability to take risks and fail.”The work of biotechnologist Craig Venter exemplifies the ethos of curiosity-driven research. His institute, with labs in La Jolla, California, and Rockville, Maryland, has always valued basic research, and as such has been involved in a series of firsts — sequencing the genomes of a free-living organism, a person and a human microbiome, and creating a self-replicating synthetic organism. Arnold has used evolutionary biology techniques to create novel chemicals. Enzymes and whole organisms synthesize non-natural molecules with an efficiency far greater than traditional chemical laboratories. Tropical diseases have historically received scant attention from biomedical science, despite the fact that they collectively affect more than a billion people. Parasitic diseases such as Chagas disease, schistosomiasis and leishmaniasis are spreading across Latin America, and many preventable diseases are resurging in developed nations as vaccination rates fall. Antimicrobial resistance is rising, and climate change is driving tropical parasites into temperate zones. Curiosity can play an important role in what are otherwise strategic and goal-driven projects, such as making affordable versions of vaccines against diseases linked with poverty; developing better formulations of existing disease targets; predicting and preventing the spread of disease; and in considering the interactions of the genome, microbiome, metabolome and environment. What is required is that researchers work together, across disciplines, using international networks to exchange data. And we should not forget the role of education and communication, said Peter Hotez, dean of the National School of Tropical Medicine at Baylor College of Medicine in Houston, Texas. Hotez urged scientists “to engage with the public more, and build scientific literacy into science and medical training”. Starting as a single pharmacy in Darmstadt in 1668, Merck has grown into an international company with a focus on healthcare, life science and performance materials. During this time, it has seen pharmacy shift from an art to a science and been part of the move to industrial production, driven always by curiosity. Merck will support the development of creative solutions over the next 35 years with a new Future Insight prize. It will bestow its first award of up to €1 million in 2019, with the goal of pandemic preparedness against emerging viral diseases. Future prizes will tackle antibacterial resistance, technology to feed the world’s growing population, and fuel generation by photocatalytic conversion of atmospheric carbon dioxide. 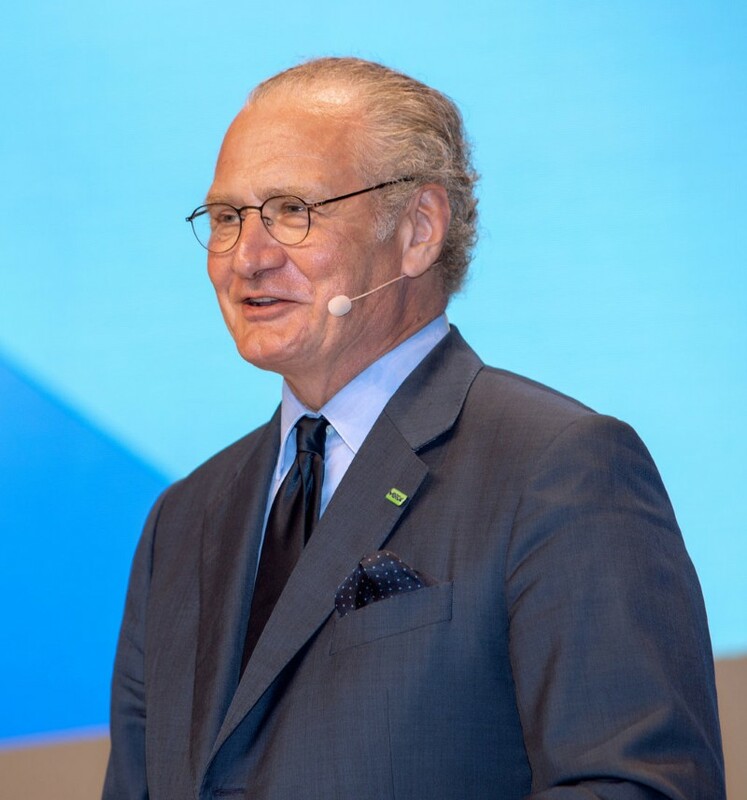 Stefan Oschmann, Merck’s Chairman of the Executive Board & CEO, announces the Future Insight prize. Directly after the conference, Merck conducted an anniversary edition of its Innovation Cup, which was contested by around 80 students from all over the world who spent a week to learn from Merck professionals and to develop an idea of their own into a business plan. The €20,000 team prize went to the Life Reimagined team who presented a concept to turn plastics into biologics using engineered E. coli to produce methionine from PET. As humans live longer, societies are ageing. And nowhere is this more apparent than in Japan, which has the highest proportion of centenarians on top of a falling birth rate. Shinichi Akaike, senior fellow, National Institute of Science and Technology Policy (NISTEP), and Naohiro Shichijo, director of the Centre for Institutional Research, Tokyo University of Technology, proposed Society 5.0 to meet these challenges. Society 5.0 aims to integrate advances in artificial intelligence (AI), big data processing and the Internet of Things (IoT) to resolve societal challenges such as healthcare and support for older people within a human-centred society. Yoshiyuki Sankai, of robotics company Cyberdyne, takes a creative approach to realizing Society 5.0: “Imagine yourself standing in the future, looking at the present, then create the technology to make this future.” Sankai’s cyborg-type HAL (hybrid assistive limb) uses the ‘intention signal’ derived from the brain to realize the intended motion of the wearer while inducing functional regeneration; another version of HAL provided is Single Joint Type, which is a compact and easy to use device that could be attached on both upper limb and lower limb. Cyberdyne also develops Lumbar Type which reduces the stress applied on the lumbar region of manual workers during lift and carry to mitigate the risk of back injury. In Society 5.0, AI will also be an important part of drug discovery and development, said Scott Spangler of IBM Watson Health. In research, AI can provide confidence scoring, validate reasoning and data, and help scientists to interrogate existing knowledge for new connections. This can aid target identification, prediction of gene function, and selection of drug indications. ESA’s planned space missions include the BepiColombo spacecraft, which will head to Mercury in October 2018 to investigate the Sun’s closest planet; and the ExoMars lander, which will land on Mars in November 2018 to study the crust, mantle and core of the planet. Curious2018 was also the birthplace of the Darmstadt Science Declaration, a global call to action to devote more resources to the advancement of science and technology to enable humanity to solve the challenges of today and to realize the dreams of a better tomorrow. The declaration can be signed online at make-science-not-war.org. 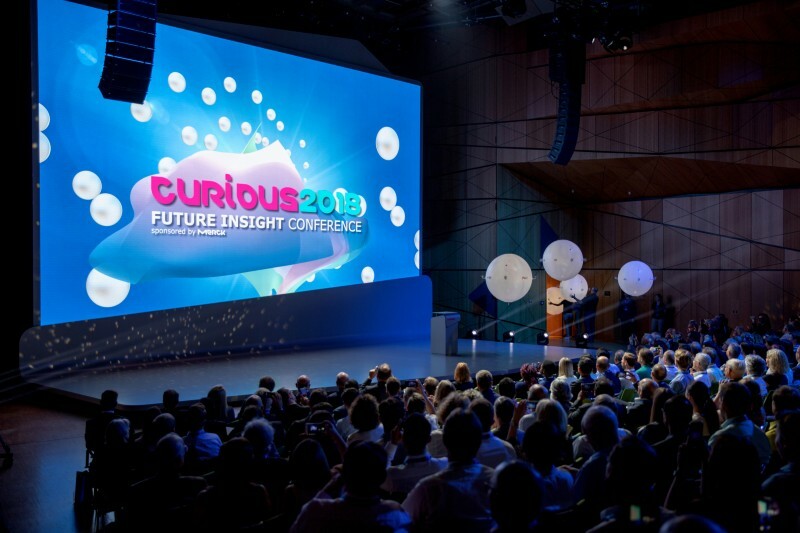 The story from Curious2018 — Future Insight is a varied one, picking a route through chemistry, biology, physics and technology. From the hugeness of outer space to the minutiae of molecular machines. From the history of pharmacy to healthcare in Society 5.0. And like the drone-powered balloons, with their curious 3-dimensional flight and ethereal internal light that were present during the official welcome ceremony, ideas from the conference will follow the attendees out of the lecture theatre and into the labs to inspire the next generation of breakthroughs.